Many of my students have lamented that when it comes to tying bows, they end up in knots more often than not. If that sounds like you, then you'll appreciate this little video which shows you how to make perfect bows every time. It's short and simple, with just the facts on how to tie perfect bows using a great little gadget called Bow-Easy. If you'd like a printable version of the tutorial, head on over to Mill Lane Studio where you can download and print a step by step pdf. It will have you mastering the art of tying bows in no time. I got so carried away weaving those little tangles of wire into bird's nests yesterday that by the end of the day I realised I had made a nest in every colour of the rainbow. That was totally unintentional but when I noticed it, it made me so happy - rainbows always make me smile in wonder. Maybe it's the legend that says there's a pot of gold that awaits at the end of every rainbow; or maybe it's the notion that the rainbow is a pathway between the earth and the heavens; or perhaps that it's a symbol of hope and optimism but rainbows uplift the soul. 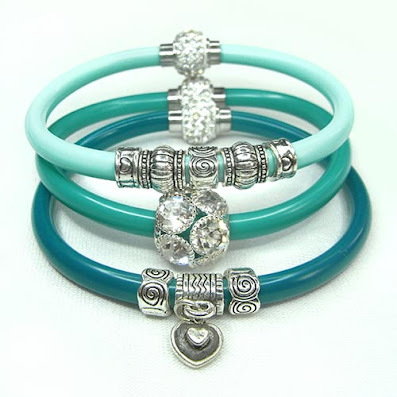 So I was in a happy mood when I put these vibrant bracelets together. Half the fun was choosing all the special beads to make them up. 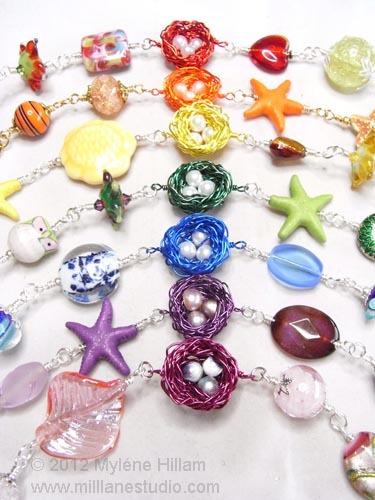 It was a surprise that plastic, ceramic, lamp work beads and even gemstones all made it into the bracelets. But hey, if it works, it works! Some, like yellow, were a challenge. It's the cheeriest colour of the rainbow, and yet my yellow bead drawer is sadly empty and the beads in it look decidedly lonely. 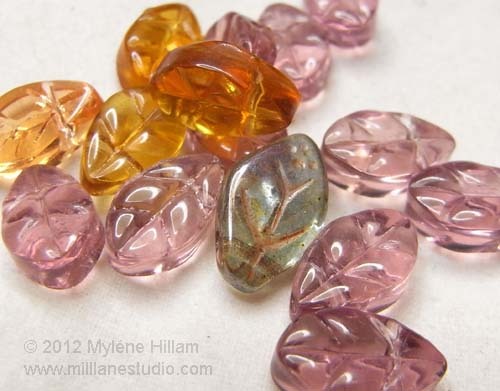 I guess yellow is not on my radar when I make jewellery/go bead shopping. And purple was difficult too. I can't believe how few purple beads there are in my collection. Now this is a sad state of affairs because it is my favourite colour. You'd think I'd have an abundance to choose from! 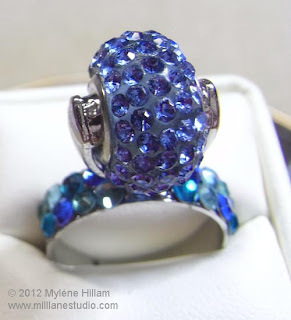 I will have to keep these two colours in mind on my next bead shopping trip! 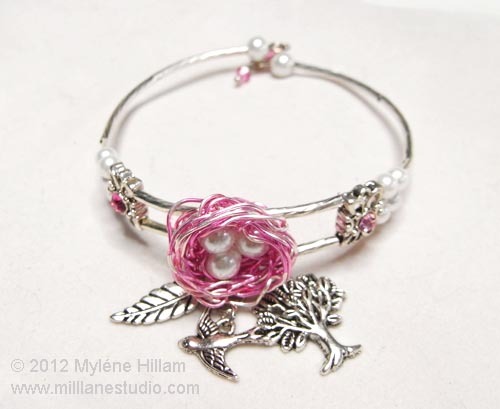 If you'd like to see the bracelets in more detail, click here for a better view. Hope you enjoy studying all the different beads in my rainbow of bracelets. 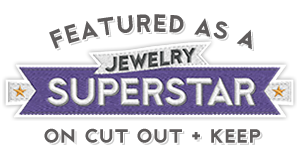 Did you know that jump rings don't always have to be round? 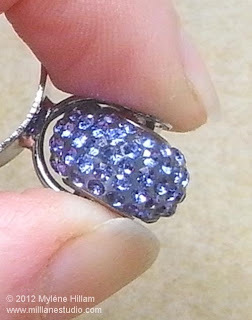 Sometimes, a round jump ring just won't go through the hole of a bead. Take these gorgeous Czech glass leaves. I really love to dangle them as charms but with their holes drilled from side to side you can't use a head pin to hang them. So here's the solution - use a triangle jump ring. 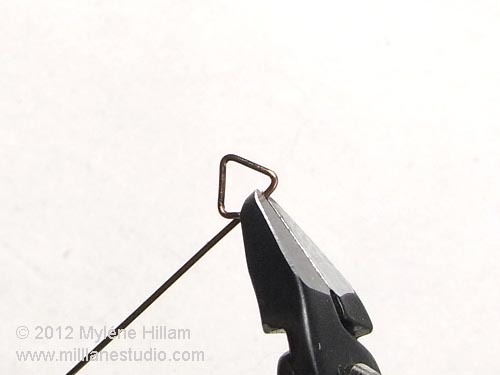 Making your own triangle jump rings is really easy with a couple of very basic tools: flush cutters for cutting the wire and wide, flat nosed pliers to form the jump rings. Flat nosed pliers give you really sharp bends and I find the width of the plier jaws gives me consistently sized triangles. 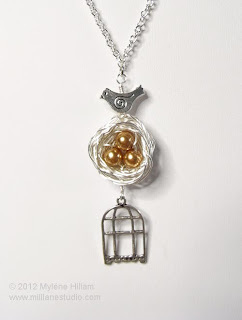 You'll need some wire such as 22 gauge or heavier but ultimately, the diameter of the hole in the bead will determine what size wire you need to use. 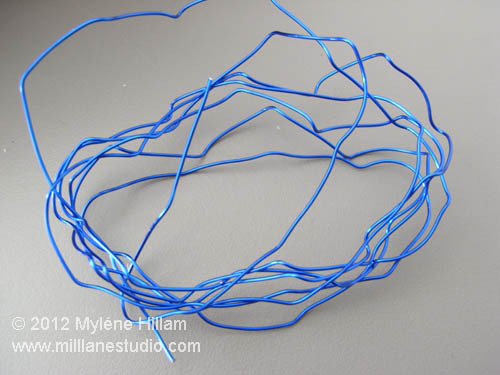 I find it easier to form triangle jump rings on the spool of wire and then cut them off after they've been formed. Start by creating the left hand base prong. Hold the end of the wire in the jaws of the pliers. 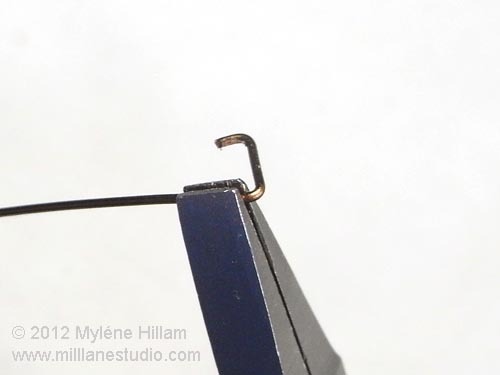 How much wire you have in the jaws will determine the width of the base/prong. Don't worry if you make them too wide at this point because you can always trim them later. Bend the wire at a 60° angle. This will be the left hand side of the triangle. 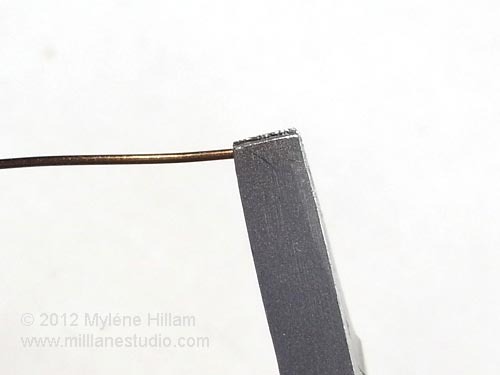 Take the wire out of the pliers and reposition the edge of the jaws flush with the bend. Bend the wire at a 60° angle again. You have now formed the top of the triangle. 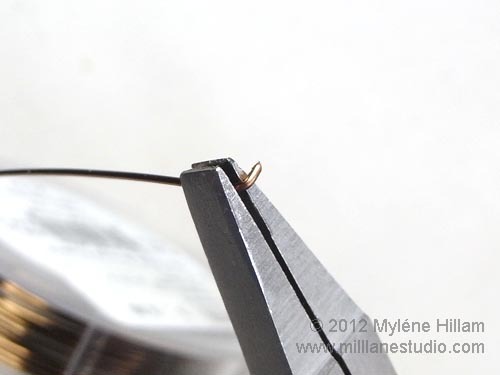 Reposition the wire in the jaws again, making sure the edge of the jaws are flush with the top bend. 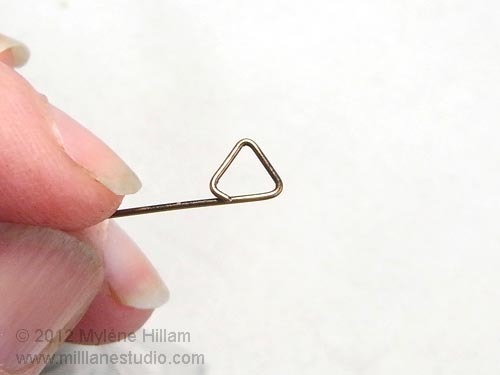 Bend the wire again to create the right arm of the triangle. Complete the third bend in the same way to create the right hand side of the base/prong of the triangle. 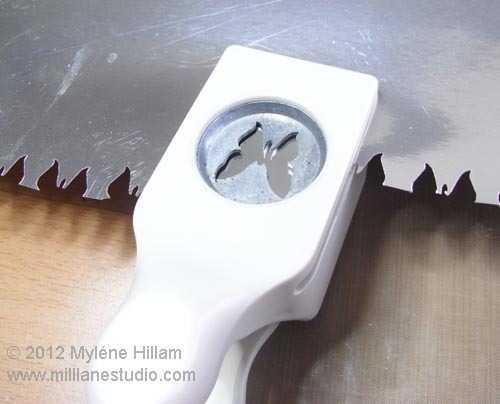 Trim the base with the flush cutters to the same length as the left hand base/prong of the triangle. 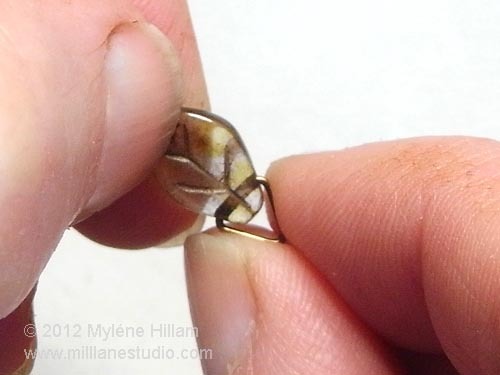 In this example, I've made the base quite short which will suit the leaf bead I'm attaching it to. 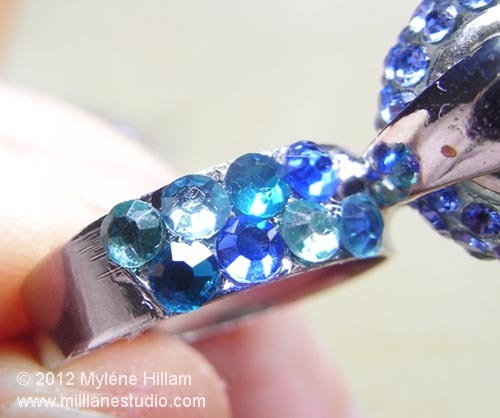 This will be a narrow triangle jump ring but you can make the base as wide as you need for your bead. To use the jump ring, we do something that we never do with a round jump ring; we open the arms out, left to right. Do this gently so you don't distort the triangle. Next, place a prong in one side of the bead and then carefully manoeuvre the other prong into the hole on the opposite side. 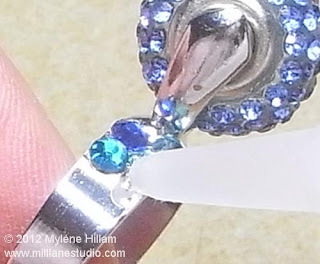 Squeeze the sides of the triangle together to make sure the bead is secure. ..... and the bead is ready to hang. 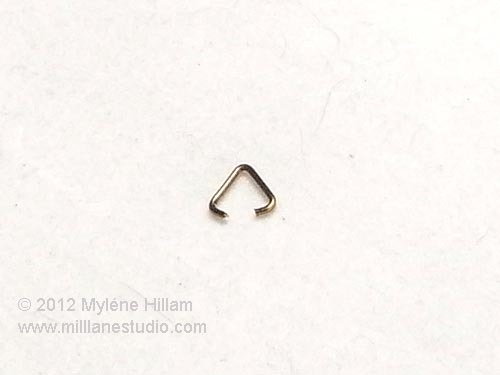 Now you know how easy it is to create your own triangle jump rings, why not also check out the post on how to make round jump rings. 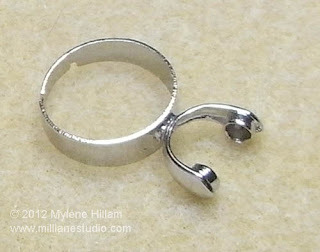 Of course, jump rings can also be oval shaped or even square but that will be a post for another day. Well campers, today's the day. Camp has finally arrived. Here's just one last teaser of the project we'll be making tomorrow morning. For those of you who haven't worked with resin before, you're in for a real treat. 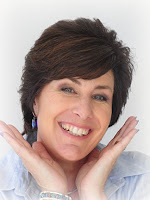 You're going to learn how such a simple technique can transform your paper stash into fashionable jewelry. And I promise, there are no jewellery making skills required. Can't wait! 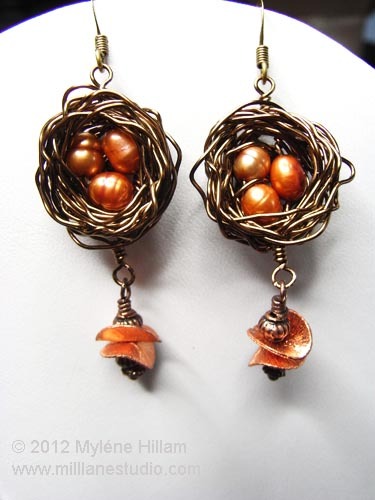 I'm sure you've seen them everywhere - those darling little bird's nests, skillfully woven out of nothing but wire. 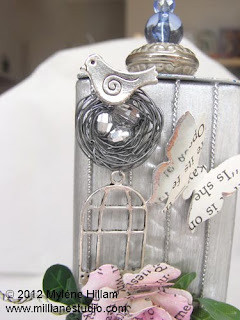 I have no idea who first came up with the idea but with birds being such a popular trend in crafting, the idea certainly caught on. 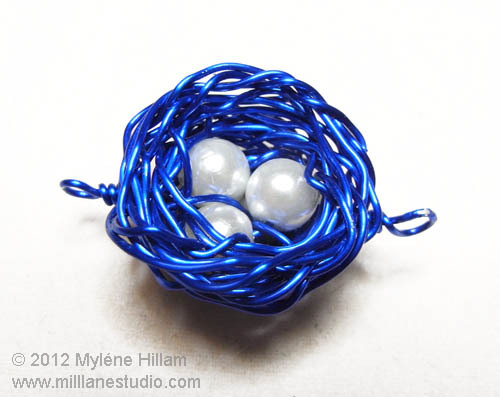 I have always wanted to have a go at making them and finally I set some time aside to do a little nest weaving. They are strangely addictive. I found that I couldn't stop at making just one - I wanted to make them up in all sorts of colours so that I could turn them into adorable pieces of jewellery. 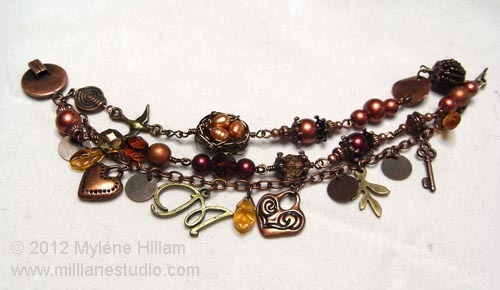 Here's a look at some of the bracelet styles I made up. 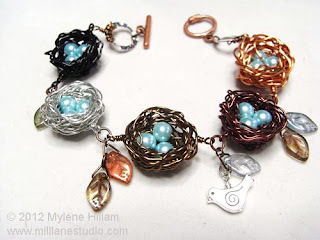 They will all be available for purchase this weekend at the SSI Stamp Camp so if you're a bird loving crafter, I hope that you'll make one of these little nests your own. Lots of different charms in a variety of shades of brown and gold. 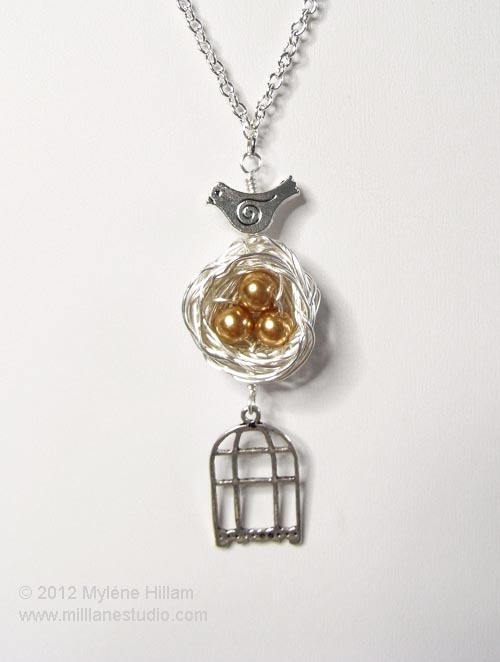 This one has freshwater pearls in the bird's nest. 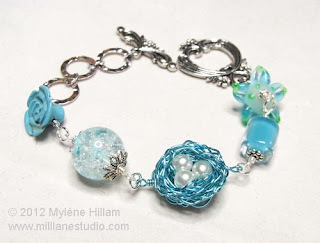 An assortment of turquoise beads including a carved turquoise rose. 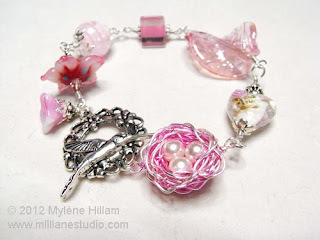 I love the hummingbird clasp on this very pretty pink bracelet. An assortment of different coloured metals makes this one my favourite. The Czech glass leaves add just a bit of movement to it. Tomorrow I'll have a ring, earrings and necklaces to share. Hope you'll check back then. On my recent visit to Michaels I found some rather unusual looking ring settings in the jewellery section. 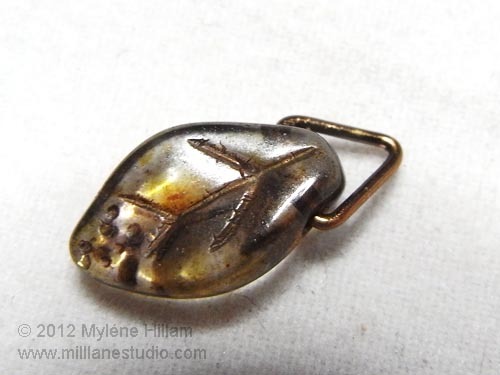 These adjustable rings from Cousin Corp have what looks like a stirrup on the top but it's actually a bail with prongs; just the perfect size to hold a Trinkette bead. But it was actually some Crystazzi bling that caught my eye and a quick and easy project was born. ........ to this, in not much more than 10 minutes! 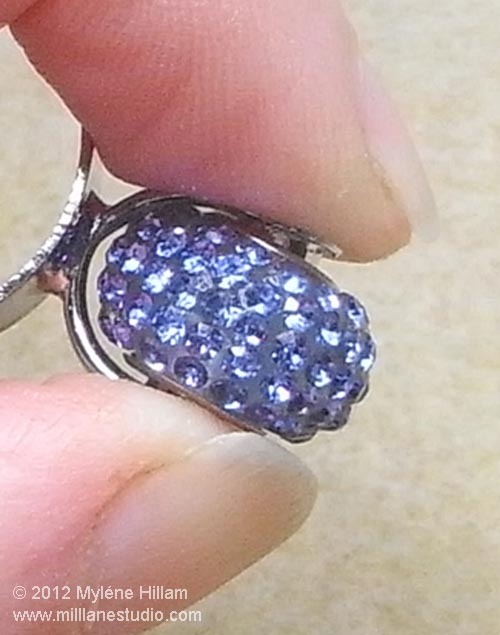 This ring finding is really easy to use. 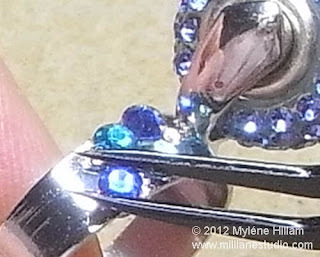 Just place your selected bead inside the bail so the bead hole and prongs are aligned and then pinch the bail together. 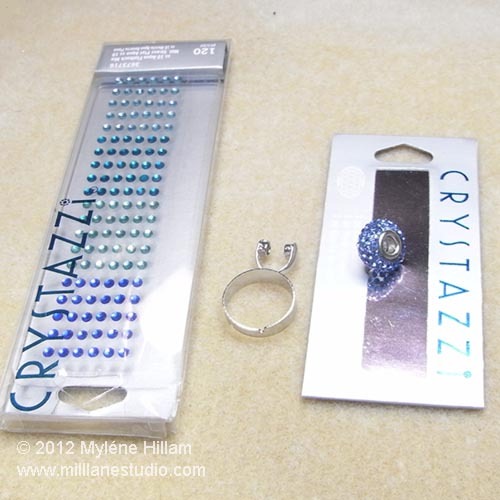 Use tweezers to help you place the crystals. 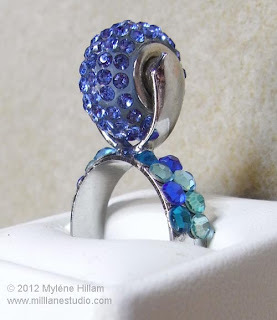 I stopped at two columns of 4 crystals so that it would still be comfortable to wear on your finger. And there it is.... a quick and easy ring with a good dose of bling! I'm in the middle of prepping kits for the Southside Stampers Annual Stamp Camp at the moment. It is a very labour intensive process and you need to enlist every little bit of help you can get. Here's the list of strategies I plan to employ. Enlist the help of volunteers - many hands make light work! To put together the little beaded components, I use the production line method: threading the beads, bending the head pin, cutting them to size, and then finally turning the loop. 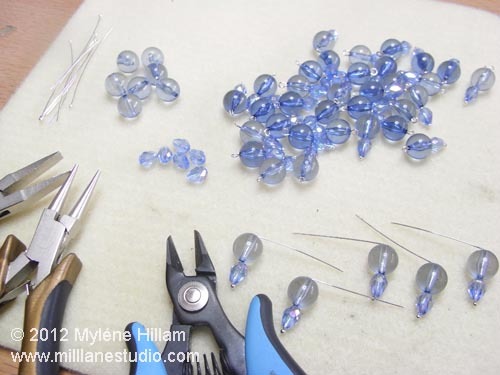 It's much faster to do the first step on all 40 of the components before moving on to the next step than it is to do all the steps on one piece at a time! But punching out the little butterflies.... well the paper punch will only handle one sheet at a time so all 200 of these will have to be punched individually. But at least they are punched and not hand cut! Painting the base for our project is going to be done on Friday night prior to the workshop by the participants. They don't know it yet, but they'll be starting this project without me! What great helpers they will make! So, what is it we will be making in this workshop? Not telling! But here's a little teaser. In my last post I showed you a pair of filigree wrapped earrings. Crystals and filigrees are a classic combination, perfect for evening wear or a special occasion like a wedding. 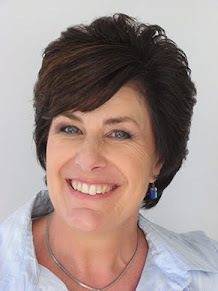 Look how easy it is to get this timeless look. 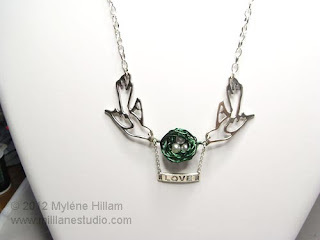 All you need is a crystal and a filigree. 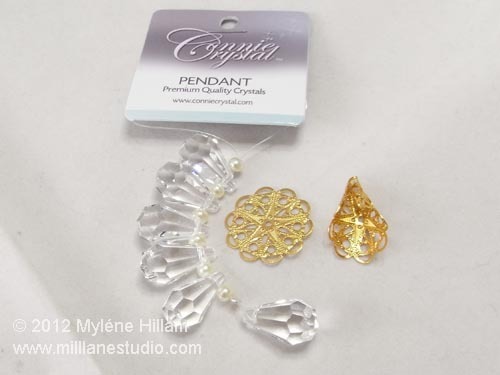 The filigree on the right started out just like the one on the left. 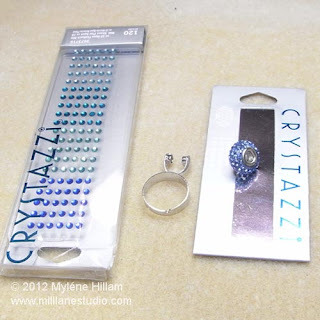 Choose a round one which is slightly larger in diameter than the height of the crystal. Place the crystal on the filigree so that it sits just at or below the bottom of the filigree. 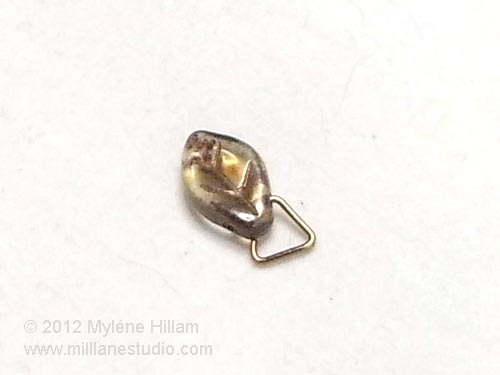 Make sure you have left yourself a point at the top where you will be able to attach it to the earring wire. For this one, I've made sure I had a loop in the centre. 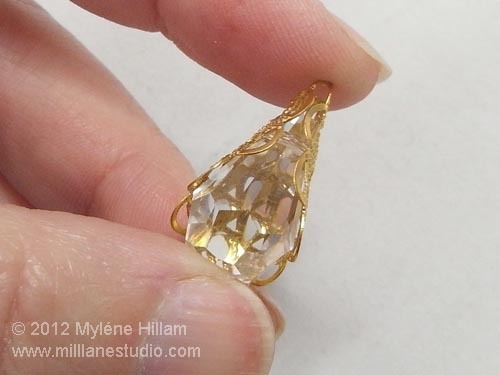 Gently wrap the sides up and around the crystal. 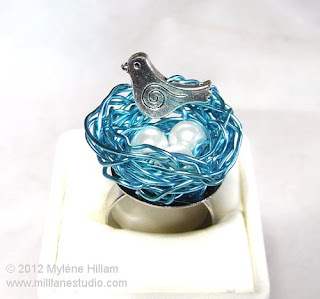 If you have chosen a soft metal, you can do this with your fingers. If your filigree is harder you will need to use round nose pliers to help. 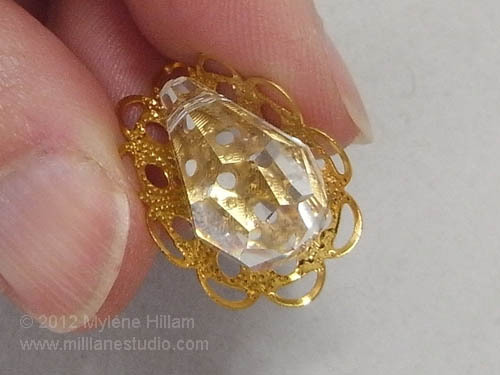 Keep working the filigree until it completely encases the crystal. 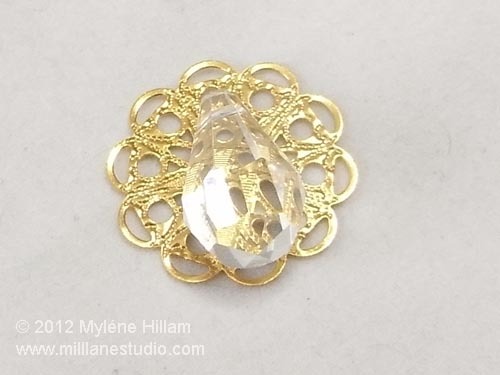 Remove the crystal from the filigree and thread it onto the centre of a 10cm (4") length of fine gauge wire (I used 28 gauge non-tarnish gold wire). 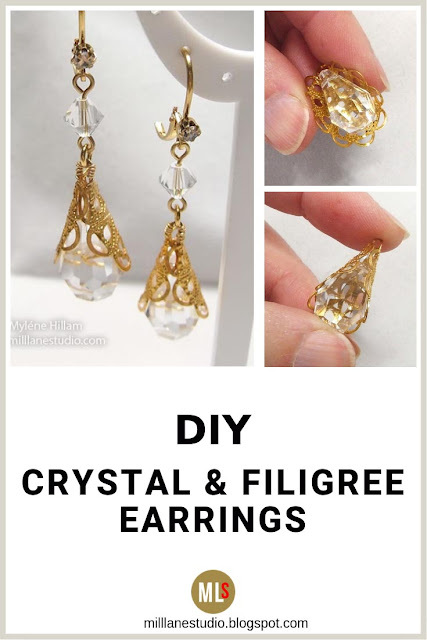 Bring the two sides of the wire together above the crystal and twist them together twice to secure. 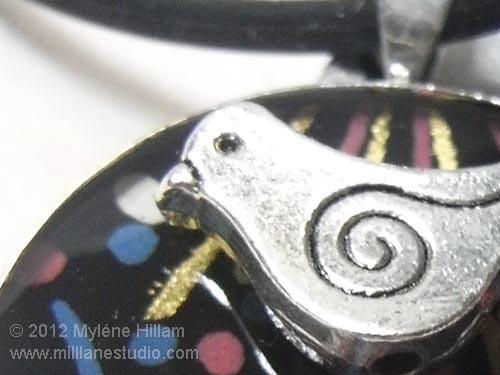 Then draw the ends through the top of the filigree. 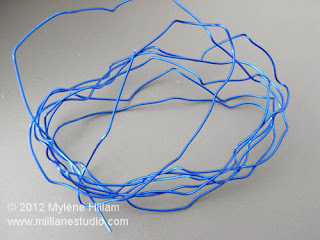 Separate the ends and wrap them around the loop several times to secure and trim away the excess. String a sparkly Swarovkski crystal on an eye, form a simple loop and then attach it to the earring wire. 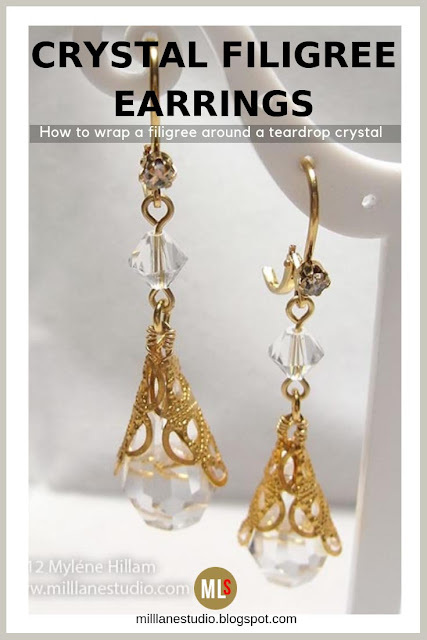 To add a bit more sparkle to your earrings, try a crystal-set earring wire. 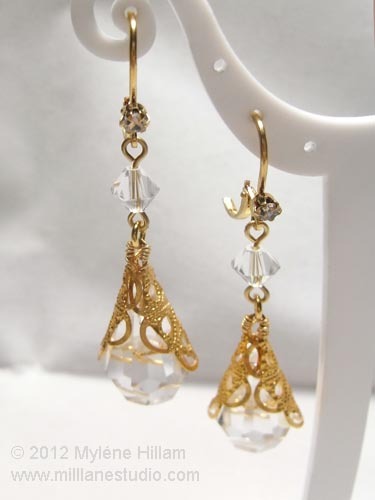 And that's all there is to it..... filigree wrapped crystal earrings that are simple, elegant and timeless!